+ Liz Allan’s Dad, “Seymour”, “Charlie”, and night club staff. This is Pig-Latin; a game where you put the first letter or consonant sound at the end of the word and add a meaningless syllable. (Iderspay-anmay iderspay-anmay, oesday atwhay erevay away iderspay ancay.) As with rhyming slang, certain Pig-Latin words seem to have become slang in their own right. Seymour is simply saying “Nix!” — stop talking everyone! It’s a fairly childish thing for high school seniors to be doing. Liz Allan’s father owns a “dinner club” — a restaurant with an a cabaret stage. Liz has not previously been represented as particularly wealthy. Perhaps the “Avenue Club” is on 71st Ave? Flash refers to Liz’s dad as “Mr Brant”, but this is a simple lettering error. A boy in a bow-tie has been a fairly consistent member of Flash Thompson’s entourage since the comic started, but this is the first time he has been named. The name Seymour, in conjunction with the habit of wearing a bow-tie to school, suggests that he is a little bit posh and preppy. (Hold on to that thought for few more issues.) Later continuity has given him the name Seymour O’Reilly. Crescent Moon — We see him load this up, but don’t find out what it does. Exhaust from glider – Creates black smoke which stops the Torch from breathing. The Goblin’s flying machine is said to be a bat glider on page 18 a goblin glider on page 14, and a jet powered goblin glider on page 2. It’s definitely nothing to do with witches, though. The “thought balloon” is one of the unique features of the comic book. Prose novelists are generally advised to only look inside one character’s head at a time. If the reader is allowed to know what Harry thinks about Hermione, she shouldn’t — certainly not in the same chapter — be told what Hermione thinks of Harry. But comic book readers find it perfectly natural to have a window into their heroes’ minds; to eavesdrop on everyone’s internal monologues at once. Perhaps comic book writers find themselves using internal monologue and soliloquy because so many stories involve secret identities and dual personalities. Or perhaps superheroes keep on having secret identities because the thought balloon lends itself so well to ironic clashes between public actions and private thoughts? It is hardly possible to think of Spider-Man without thought balloons. Take away his worry, his self-pity, the celebrated “problems of Peter Parker” — all expressed entirely through thought balloons — and all you’ve got left is a strong kid who likes to go out in his nightwear. It is the visual grammar of comics which allows his conflicted personality to express itself. Spider-Man is not just two people; he is three people. He is shy, nerdy, Peter Parker; and he is also boastful, arrogant Spider-Man. 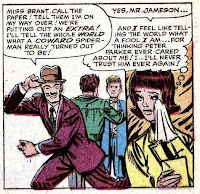 (Peter Parker looks an awful lot like Steve Ditko and Spider-Man sounds more like Stan Lee with every issue.) Over the past year — ever since Parker stopped wearing his glasses — he has started to reach a golden mean between the two sides. Peter has become a good deal less anti-social, and much less whiny. Spider-Man has become less of swaggering braggart; his playground sarcasm has evolved into genuine wit. There have been scenes — when Aunt May and Betty Brant are teasing him at the end of the Annual — in which Peter Parker actually comes across as a decent human being. But however cool Peter Parker mostly pretends to be; and however funny Spider-Man usually is; beneath the surface is a third voice which only we readers hear. It's the real voice of Spider-Man which speaks through thought balloons and asides. “It’s not fair.” “Everything I do goes wrong.” “Why don’t I have any friends?” “Why is everyone against me?” It’s this nagging voice which hates being Spider-Man, which wants to throw the costume away, and which, in the Sinister Six story literally wished Peter Parker’s powers away and rendered Spider-Man physically helpless. The more consciously you repress an emotion, the more unconscious power that emotion will have over you. The more determined Spider-Man is not to be the kid from Amazing Fantasy #15 the more the voice of Puny Parker will nag him. “I wish I’d never gotten my powers.” “I wish there were no such thing as my costume.” “I wish I was a normal teenager.” “Some day they’ll be sorry”. So: there is only one story which could ever bring the tragedy of Spider-Man to an end. It would be the story of how the Spider-Man/Parker gestalt finally silenced the child Peter. At which point, The Amazing Spider-Man would stop being strictly the history of a boy and become the history of a man. The Amazing Spider-Man issues #16, #17 and #18 sets out to be that story. Individually, they are three of the best episodes of the original run. Considered as a triptych, they are are the definitive Spider-Man tale. In the remaining months of their collaboration, Lee and Ditko will produce at least six bona fide classics, and the single most iconic page in the history of superhero comics., but they will never do anything quite this good again. And neither will anybody else. The first part of the triptych, The Return of the Green Goblin is very nearly a farce, built around a mounting series of misunderstandings between Peter Parker, Spider-Man and the five characters who know him in both roles. Each lie or misunderstanding creates a worse one, until, at the moment of maximum confusion, an out-of-the-blue denouement cuts the Gordian knot. Flash Thompson, who hates and despises Peter Parker, is Spider-Man’s biggest fan. This has been a given almost since the comic started: this issue, he actually starts a Spider-Man Fan Club. Liz Allan wants Peter to go to the club meeting, because she like him, and also because it will annoy Flash. Flash wants Peter to stay away, because he's a nobody from dullsville. Although it’s a proper meeting in a proper night-club with tuxedos and press reporters, Flash persists in acting as if it’s a schoolboy pow-wow in a tree house. (“This is my fan club. I didn’t invite puny Parker to come.”) But he is desperately hoping Spider-Man will attend. Only we and Peter see the joke. Betty wants Peter to take her to the meeting: although quite why she wants to go to a fan-event when she can’t bear thinking about Spider-Man is never tackled. J. Jonah Jameson also wants Peter Parker to go and take photos; and poor Aunt May wants him to take the mysterious Mary Jane Watson. (It seems that M.J “just loves Spider-Man”, which, in the light of what is going to happen over the next few years, is just as well.) But Peter can’t go with Betty or Liz or Jonah or Mary because he has decided that he will indeed be there as Spider-Man. So Betty — who by this point has no discernible personality left apart from her jealousy — assumes that he is standing her up for Liz. Just to add to the fun, Spider-Man’s arch rival Johnny Storm turns up. Johnny, whose identity is not a secret, can openly take his girlfriend Dorrie Evans, and chat to her about being the Human Torch, which is slightly rubbing salt in Spider-Man’s hang-ups. 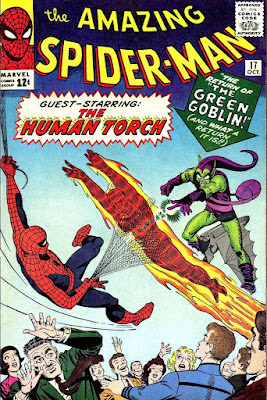 Finally, Spider-Man’s newest enemy, The Green Goblin, decides to gatecrash the party to fight Spider-Man. The Goblin has no particular motivation: he’s coming to the club to fight Spider-Man because, as a super-villain, that’s what he does. The cover is a subtle variation on Ditko’s favourite motif: the crowd looking up at the hero. At the top of the page the Torch, the Goblin and Spider-Man are engaged in a chaotic melee; while at the bottom Jameson, Liz, Betty, Flash and some less familiar faces look up with various levels of shock. This is a story about a fight: but it's also a story about how the people in Spider-Man’s life react to the fight. At no point in the story is Peter allowed to put on the mask and simply become Spider-Man: in every panel we are reminded that he is Peter Parker as well. This is nicely underlined on the first page: Peter Parker sits at his school desk, with a huge thought-balloon above his head, showing him battling the Green Goblin as Spider-Man three issues ago. He is Peter Parker on the outside; but he is Spider-Man on the inside. Peter Parker’s life literally encloses Spider-Man’s. 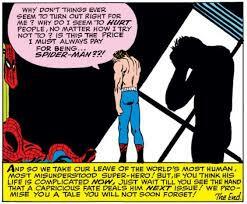 Amazing Spider-Man #17 is probably the first story plotted wholly by Ditko without input from Lee. We complained that stories like Marked for Destruction by Doctor Doom and Unmasked by Doctor Octopus were spoiled by Stan Lee’s tendency to regard the “plot” as something you gallop through to get to the “action”. Very good ideas like Flash Thompson pretending to be Spider-Man and Mysterio making Spider-Man doubt his sanity were wound up in the first ten or eleven pages, so that the second half of the comic could be wholly given over to a fight. The Return of the Green Goblin does to some extent follow the Stan Lee formula — a lot of the plot does happen in the first half, and the fight does break out on page 12. But Ditko — assuming he is indeed the onlie begatter of the episode — continues to ratchet up the Parker-centric confusion all the way through the Spider-centric fight. All the set-ups in the first half have pay-offs in the second; several of them have consequences over the next few issues. 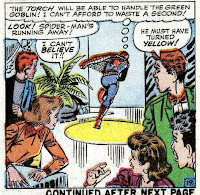 We might have expected that, once the Green Goblin arrived on the scene, the Human Torch would have joined the fight on Spider-Man’s side. But Ditko chooses to make the situation more complicated. The Torch rushes through the fight to stop a separate crime (three burglars are trying to rob the safe). 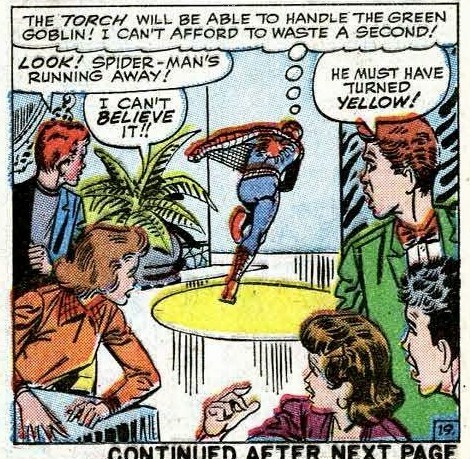 As a result, he gets webbed by Spider-Man, who was aiming at the Goblin. This could have come across as a bit of a cop-out. The romantic entanglement around Betty and Peter and Liz and Flash, to say nothing about J.J.J’s annoyance that his favourite photographer has once again turned up without a camera, are left unresolved. Spider-Man simply walks away. But in fact, it is the perfect ending to a perfect episode. Every single complication has arisen because Spider-Man is also Peter Parker; so at the final moment, Spider-Man leaves the fight because Peter Parker has to be somewhere else. 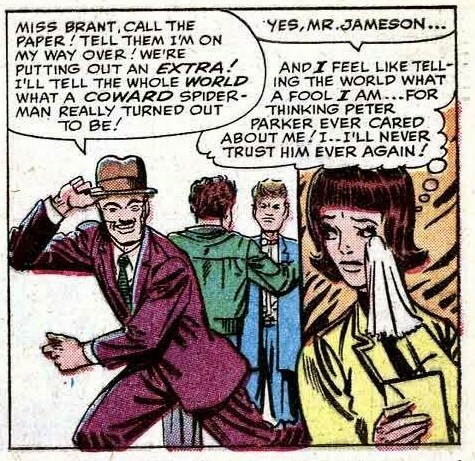 “And I feel like telling the world what a fool I am…for thinking Peter Parker ever cared about me!” thinks Betty Brant. A lot of narrative is crammed into that one tiny panel. Jameson is going to tell the world Spider-Man is a coward; Betty wants to tell the world that Peter Parker is a cad. The readers can see the irony: that they have both leaped to the wrong conclusion — about the same guy. Jameson is happy — with a ridiculous grin; Betty is sad — wiping her eye with a handkerchief. Jameson is all motion, Betty is still. And the frame defines what the next two issues will be about. The combined bad opinions of Betty and Jonah will bring Peter Parker to the brink of quitting. This is just about the wrongest thing anyone has ever said. Peter Parker’s relationship with J. Jonah Jameson indicates that he is at least somewhat interested in wealth. And he is intensely concerned about fame. He goes to the fan-club meeting to please Flash; and because the irony of the situation appeals to him; but mostly, he goes because he wants to be popular. “This is my big chance! If I make a good impression in there maybe people will stop distrusting me and start liking me the way they like the Torch.” For him, life is a great big performance: he markets his image to newspapers, he began his career as a variety act; in the last few months he has tried to break into movies and the circus. Doing the right thing is not it’s own reward; neither is action. What Peter Parker wants is for people to like him. But when it comes to it, and he has to choose between doing the right thing and doing the heroic thing, it’s a literal no-brainer. He doesn’t agonize or soliloquize: he acts. He would rather be a nephew than a superhero. It barely even amounts to a choice. Spider-Man runs out on a fight so Peter Parker can be with Aunt May. And so, we are right back where we started. The very first panel of Amazing Spider-Man #1 showed Peter Parker throwing his costume across the room, crying “My Spider-Man costume! I wish there was no such thing!” And now he's doing it again. Stan Lee has only handed the reins to Steve Ditko for one issue, and Ditko has come very close to destroying the character. Is there any way of moving forward with a hero who quite clearly doesn’t want to be a hero any more?